Quick summary: The Enviroweek Waste Warrior Action encourages students to explore their day-to-day wastage, the impacts of their waste, and how to make better choices with regards to waste. This resource is presented in the form of three separate but linked activities and has been differentiated into two activities, one for lower primary and one for upper primary. Students understand the role and impact of excess waste on the environment. Students collect data about the school’s renewable and non-renewable waste management systems. Resources required: Art materials, for younger students – Which bin does it go in?, for older students – Great Pacific Garbage Patch Worksheet. Homework and extension opportunities: Students may choose to examine their waste collection system at home. Hot Tip: Try to get the whole school involved in the Waste Warrior Challenge for Enviroweek. You may need to obtain approval from the Principal. Syllabus outcomes: ST1-11LW, ST1-9ES, ST2-11LW, ST3-6PW, ST1-4WS, ST2-4WS, ST3-4WS, EN1-1A, EN1-4A, EN2-2A, EN2-6B, ENe-1A, MA2-10MG, MA2-11MG, MA2-12MG, MA2-9MG, MA2‑1WM, MA2‑2WM, MA2‑3WM, MA3-10MG, MA3-17MG, MA3-9MG, MA3‑1WM, MA3‑2WM, MA3‑3WM. Overarching learning goals: Younger students build an understanding of their personal impact at school by looking at the classroom waste sorting system. They collect data about the school’s renewable and non-renewable waste system. 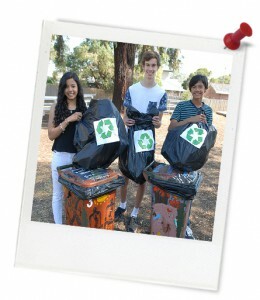 Students rethink the concept of waste and take action to reduce their personal impact. Older students build an understanding of their personal impact on the planet by looking at how rubbish enters the marine environment. They make comparisons between areas they know well and the estimated area of the Great Pacific Garbage Patch, and they rethink their ideas about waste and take action to reduce the impact of their personal attitudes and behaviours on the environment. In groups, you are to design your Waste Warrior Action. The aim of the Waste Warrior Challenge is to help you explore your day-to-day waste practices and encourage others to make better waste choices. Think outside the box but make sure that the details of your project are aligned with the design principles of a SMART goal: Specific, Measurable, Achievable, Relevant and Time Bound. No idea is too big or too small at this stage. Have one group member record all the ideas generated, then begin discussing them. Complete this task as a group. What do you hope to achieve through this project? Complete this task as a group.